(CHRIS) Paul used his personal charm to work his way into the confidence of the Lodge owner. Arnot was a grizzled white Namibian with 2 little blond kids. He let us stay free of charge because his water was not working. He also gave us lots of advice about the rest of our itinerary. A jack-of-all-trades, Arnot had 2 of his workers sell us some of his petrol supply. It would be nearly 500 km’s before another gas station. Arnot was totally jungle saavy. He knew all the in’s and out’s of the region and ran the lodge and Kaudom tours. What a guy. As soon as we left Tsumkwe heading north, we were on an eternally sand “road.” We passed a few San people living nearby but soon enough, we were completely alone… people-wise. Seriously, there was only one main road through the park and we saw NO ONE from the (9am) until exiting (9pmish). BUT WE SAW ANIMALS. 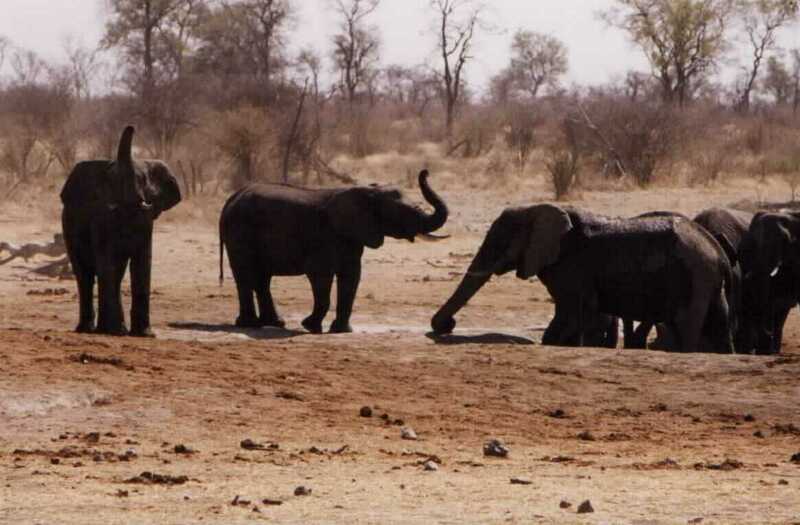 At our first watering hole, there was an astounding number of elephants. The whole crowd numbered nearly 100 and they were jammed together because the pool was so small. At one point, a huge crowd approached another huge bunch. Each had the biggest elephant in the lead. We thought there might be a rumble. But when the 2 leaders met, they intertwined their trunks and then the groups intermingled. It was like 2 mafia families coming together for a big picnic. Although the viewing was great – they were only 50 feet away – we had a long way to go, so we moved on. P.S. – There was no one at the park entrance gate or exit so we paid no fees. We took the path Arnot recommended, stopping at all the best water holes. EVERY single one had pacyderms (never as many as at #1 though.) We noticed that each hole had a solar powered well pump to keep the wildlife watered. We got out of the car at several stops to stretch and improve our views. One of these stops caused an elephant to charge towards us. We jumped in the Asia and drove away as fast as possible, the giant chasing a mere 30 feet behind. He gave up when he saw we were leaving the water for him alone. Shortly after this, I spotted 2 female lions lounging on a raised tuft 50 feet away. They paid us no head despite our yelling. I guess even though it was not tourist season, they recognized our type and remembered that 4x4’s taste horrible. They were awesome cats, but onward we went. The general lay of the land was usually forested by medium size trees, often sporting fall colors still. 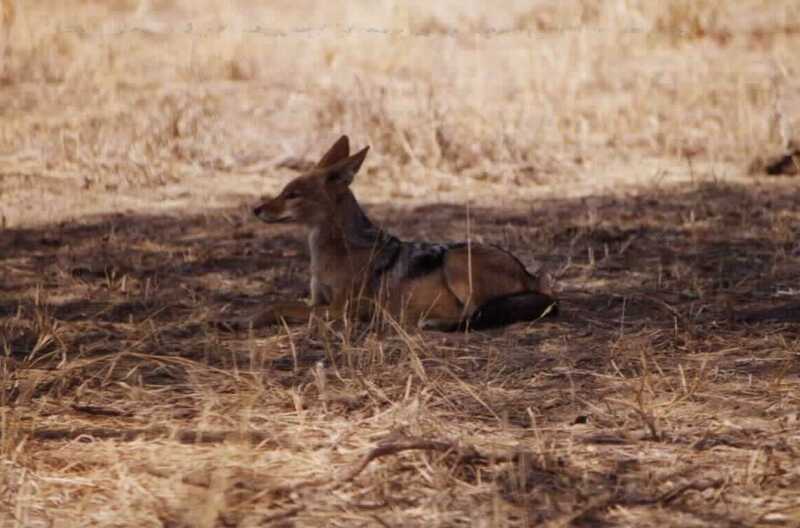 The grass alongside was the classic African type – yellowish tan. There were some rocks, but mostly just a sand coating under it all – especially the road. Some parts of the road were bumpy enough to make the rear passenger hit his head on the ceiling. I drove once but got stuck in the sand. Sam drove us out with me pushing. I climbed onto the spare tire as the car moved out and rode a few km’s from there. It was a great view so Paul stood up there for awhile after me. (PAUL) We drove on as the shadows lengthened. We still had a long way to go before getting out of the park and sunset was upon us. We eventually reached the Kaudom campsite, but by now it was dark. There was no one at the site (in fact, we think we were the only tourists in this whole reserve.) We came to a confusing set of roads that went in 4 or 5 different directions. One wrong turn could lead to hours of driving. We would have gotten lost and run out of gas. Hello wild camping amongst the lions. Fortunately, out of the darkness, we saw 2 tractor lights heading toward us. A local worker at the reserve jumped off his tractor (Sam and Chris say he was just like Jon Carlson) and gave us the correct directions to B-8 and the Northernmost part of Namibia. Relief. Thank you, St. Christopher of Namibia. We never did get lost (which is a miracle) but we did get stuck in the sand. At about 9:30pm, we were slowly but steadily moving on the sandy tracks. The tracks were deep and tended to shift the car at will. Before we knew it, our Jeep Rocsta was stuck in sand. Our attempts to get out only made it worse when the wheels spinned a deeper hole. (cliché: when you are at the bottom of a hole, stop digging.) We all got out. Chris and I pushed while Sam drove to no avail. We had to dig out of this giant sandbox. For 30-45 minutes, we dug and dug until it finally came loose. Sam simply didn’t think of the possibility of lions pouncing. Chris and I listened to every rustle of grass with super sonic hearing to decide if we should all dive into the Jeep to avoid hungry lions. The moon was red, which only added to the suspense. Finally, we got to a superhighway, breathed a sigh of relief and thanked God it wasn’t worse.